It looks like emerging market investors took my last post (“Investors” Shouldn’t Worry about the Euro) to heart, since emerging markets (EM) have continued to rally in spite of the Euro’s woes. To be sure, EM stocks, bonds, and currencies all dipped slightly in May when the crisis reached fever pitch, but they have since recovered their losses and are once again en route to record highs. That’s not to say that that surge in risk-aversion wasn’t justified. In fact, investors are continuing to punish the Eurozone as well as a handful of other risky areas. However, analysts have concluded that in the case of emerging markets as a whole, this mindset doesn’t really make sense. Simply, the fiscal and economic condition of is stronger than in developing countries. Whereas previously crises were known to originate in developing countries and spread to industrialized countries, this latest series of crisis turned that notion on its head. The credit and housing crises were largely the product of speculation in the West, and the sovereign debt crisis originated in Europe. While it’s possible that investor concern would self-fulfillingly cause the crisis to spread to emerging markets, any impact would probably be muted. “There is recognition that emerging market balance sheets are strong and the debt to GDP ratio is below 40 per cent compared to the western world, where it is over 100 per cent in many countries,” summarized one analyst. “The vast majority of emerging market countries ‘have the tools to tackle inflation and will succeed, having reasonable independence from their central banks,’ ” added another. Thus, the funds continue to pour in. “Net inflows into emerging market debt totalled $30.6bn (£20.7bn, €25bn) from the beginning of the year to late May compared with $33bn for the whole of 2009.” Here’s another sign of EM confidence: “IPOs in developing countries raised $29.3 billion this quarter, almost three times the amount in industrialised nations.” Meanwhile, the MSCI Emerging Market Stock Index has just finished its strongest rally since 2005, and the JP Morgan Emerging Market Bond Index (EMBI+) is closing in on another record high. This is frankly incredible when you consider that around half of the countries with the largest weightings in the index have experienced debt crises of varying severity over the last decade. As far as forex investors are concerned, the confidence in EM capital markets should also extend to currencies. The carry trade is heating up (thanks to the cheap Euro), and will probably only expand as EM Central Banks move to raise interest rates to combat inflation, as alluded to above. If the Eurozone debt crisis intensifies, then you can expect some kind of pull-back. As with recent retracements, however, it will be only temporary. The Swiss National Bank (SNB) has apparently admitted (temporary) defeat in its battle to hold down the value of the Franc. ” ‘The SNB has reached its limits and if the market wants to see a franc at 1.35 versus the euro, they won’t be able to stop it.’ ” The markets have won. The SNB has lost. Still, the SNB should be applauded for its efforts. As you can see from the chart above, it managed to keep the Franc from rising above €1.50 (its so-called line in the sand) for the better part of 2009. 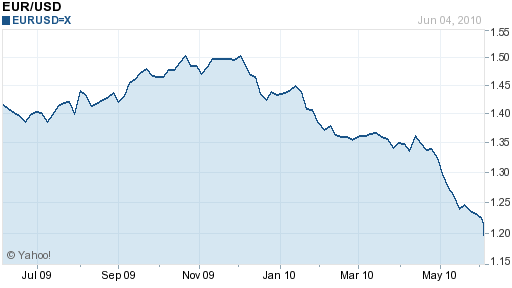 Furthermore, by most accounts, it managed to slow the Franc’s unavoidable descent against the Euro in 2010. While the Dollar has appreciated more than 15% against the Euro, the Franc has a risen by a more modest 10%. ” ‘Without that €90 billion [intervention], it’s fair to say that the euro would be closer to $1.10,’ ” argued one analyst. In fact, as recently as May 18, the SNB manifested its power in the form of 1-day, 2% decline in the Franc, its sharpest fall in more than a year. Overall, the SNB has spent more than $200 Billion over the last 12 months, including $73 Billion in the month of May alone. ” ‘To put the figures in perspective, there have been only two months when China, the world’s largest holder of forex reserves with $2,249bn in assets, saw its reserves increase more.’ ” The SNB now claims the world’s 7th largest foreign exchange reserves, ahead of the perennial interveners of Brazil in Hong Kong, the latter of whose currency is pegged against the Dollar. While the SNB can take some credit for halting the decline in the Franc, it was ultimately done in by factors beyond its control, namely the Eurozone sovereign debt crisis and consequent surge in risk aversion. At this point the forces that the SNB is battling against are too large to be contained: “We’re talking about a massive euro crisis, so no single central bank can prop it up on its own,” summarized one trader. 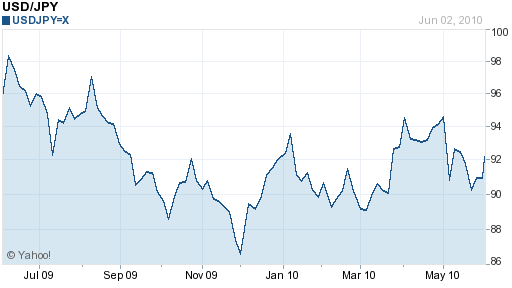 As a result, the Franc is now rising to a fresh record high against the Euro nearly every trading session. Still, the SNB remains committed to rhetorical intervention. “The central bank has a ‘clear aim‘ to maintain price stability and this is what guides its policy actions, SNB President Philipp Hildebrand said…The bank will act in a ‘decisive manner if needed.’ ” That means that if economic growth slows and/or deflation sets it, it may have to restart the printing presses. Given that its economy is slated to grow at a solid 1.5% this year, unemployment is a meager 3.8%, and the threat of inflation has largely abated. On the other hand, the prospect of a drawn-out crisis in the EU means the Franc will probably continue to appreciate – without help from the Central Bank: ” ‘The SNB may continue to intervene in the currency markets until 2020,’ ” declared the head of forex research for UBS. The implications for currency markets are interesting. Not only has the SNB prevented the Euro from falling too fast against the Franc, but it may also have prevented it from falling too quickly against other currencies. ” ‘To suggest that the SNB has been the savior of the euro is too much. But one could imagine that if the euro starts to decline again, the market may blame the fact that the SNB isn’t buying,’ ” said a currency strategist from Standard Bank. This episode is also a testament to the limits of intervention. It has always been clear (to this blogger, at least) that intervention is futile in the long-term. The best that a Central Bank can hope for is to stall a particular outcome long enough in order to achieve a certain short-term policy aim. When enough momentum coalesces behind a (floating) currency, there is nothing that a Central Bank can do to stop it from moving to the rate that investors collectively deem it to be worth. Something incredible has happened: The Euro has reversed is 16.5% decline (from peak to trough), and since bottoming on June 7 at $1.1876, it has risen by an impressive 4%. I guess that means the Euro has been rescued from parity (which I characterized as “inevitable” on June 5)? Not exactly. While financial journalists have interpreted this as a recovery in risk appetite, and mainstream investors dismiss all of it as mundane fluctuations in exchange rates, currency traders – both fundamental and technical – know better. They know that this rally is merely a correction, the product of the Euro falling too much too fast against the Dollar and a consequent short-squeeze. They know that there is nothing underpinning the Euro rally, and that since the bad news continues to emanate from the Eurozone, a further decline is inevitable. ” ‘We could be one or two headlines away from a crisis again. This problem didn’t occur in a couple of days, nor is it going to resolve itself in a couple of days,’ ” summarized one trader. From a fundamental standpoint, the last two weeks have brought further indications that the crisis is still mounting. The credit rating on Greek sovereign debt was cut to junk (A3) by Moody’s, following a similar move by S&P in the spring. Fitch, while arguing that the Euro has already declined “too far” is simultaneously threatening to do the same. Politicians, for their part, are still struggling to convince investors that they are serious about trimming their budgets and uniting for the sake of the Euro. “I see good news from the current euro-dollar rate, French Prime Minister Francois Fillon told reporters…’and I have been saying for years that the euro-dollar rate didn’t reflect reality and was penalizing our exports.’ ” With comments like that, is there any cause for believing them?! At this point, then, the only issue is when the Euro will resume its decline. Those with a technical bend think that the Euro will fail to breach a psychologically important level (perhaps $1.25 or $1.27) after exhausting the rest of its momentum, at which point it will resume its precipitous decline. Those who see things in fundamental terms argue that when this happens, it will likely be due to more bad news about the crisis and/or a recovery in risk appetite (the contradiction between the two notwithstanding). Rest assured, Euro bears. Your friend, the trend, is still intact. Throughout 2010, I have continuously reported on the apparent inevitability of the Chinese Yuan appreciation. That the currency still remains firmly fixed in place against the Dollar is a testament not only to the unpredictability of forex, but also to the doggedness of Chinese officials. It seemed that China’s policymakers were all but set in February to allow the currency to resume its upward path (its appreciation was halted in 2008). If anything, the case for appreciation is stronger now than it was then. China’s economy grew by a blistering 11.9% in the first quarter. The bilateral trade surplus with the US has widened on the basis of strong export growth. Inflation has exploded, and there is a property bubble that refuses to cool. This isn’t doing much to assuage American lawmakers, whom are currently being slighted by both sides. While China irks Congress by refusing to adjust the RMB, the Treasury Department is also irritating it by both refusing to label China a currency manipulator and by not establishing a deadline for appreciation. As a result, “There is a broad consensus in Congress for a simple proposition: ‘China is not acting in good faith and is aggressively engaged in a series of troubling and downright protectionist policies that put our economic relationship at risk.’ ” Finally, it seems that rhetoric will become reality, as a bill is currently being mulled that would aim to punish China (via punitive tariffs and WTO action) for failure to revalue. Analysts are not optimistic. “The yuan’s 12-month non-deliverable forwards were at 6.7415 per dollar…reflecting bets for a 1.2 percent strengthening over that timeframe.” That’s down from expectations in April of a 3.5% appreciation. Some still believe that China will revalue in the third quarter, but there is no longer any force behind those predictions. Meanwhile, China continues to make long-term plans for its foreign exchange reserves, which indicates that it has no intention of unloading it as part of a controlled RMB appreciation. At this point, it’s essentially a game theory problem: when will China budge? In the midst of the Eurozone debt crisis, forex investors have largely stopped paying attention to interest rate differentials and focused the brunt of their attention on risk. Soon enough, however, there will be a resurgence in the carry trade, at which point interest rates will return to the forefront of investors consciousness. From the standpoint of the carry trade, the US Dollar should be one of the least favorite currencies, since it offers investors a negative real return (without taking exchange rate fluctuations into account). If not for the sudden increase and volatility and consequent ebb in risk appetite, the Dollar would probably still be falling, and would continue to fall well into the future. To understand why, one need look no further than the current Fed Funds Rate (FFR), from which most other short-term rates are (indirectly) derived. The FFR currently stands at 0 -.25%. Moreover, the debt crisis could potentially hamper the US economic recovery and the appreciation in the Dollar is causing inflation to moderate, which has removed almost all of the impetus for the Fed to hike rates anytime soon. There is also the problem of high US unemployment and recent stock market declines. There is currently a tremendous amount of uncertainty, as nobody can say definitively whether the US economy has turned the corner or whether it is headed for double-dip recession. Most at the Fed think that the US recovery still remains on track. According to Federal Reserve Bank of Chicago President Charles Evans, “As the recovery progresses and businesses become more confident in the future, employment will increase on a more consistently solid basis. My forecast is that real gross domestic product will grow about 3.5%.” In fact, some of the hawks at the Fed see this as a justification for preemptive rate hikes and/or an unwinding of the Fed’s quantitative easing program. The President of the Kansas City Fed argued recently, “Even if the target was increased to 1 percent, policy would remain very accommodative,” while the Philadelphia Fed President added that the Fed should start selling some of $1 Trillion in Mortgage Backed Securities currently on its balance sheet. Still, such voices represent the minority, and besides, most of the hawks don’t current have any voting power. In other words, it will probably be a while before the Fed actually hike rates. Futures contracts currently reflect an infinitesimally low probability of rate hikes at any of the Fed’s summer meetings. “The February 2011 fed-funds futures contract priced in a 48% chance for the FOMC to lift the funds rate to 0.5% at its Jan. 25-26 meeting.” Meanwhile, an internal Fed analysis has concluded that based on previous rate-setting patterns, it is unlikely that the benchmark FFR will be lifted before 2012. In short, US short-term rates will remain low for the indefinite future. For now, the “safe haven” mentality dictates that investors are less focused on yield and more concerned about capital preservation, which means no one is paying attention to the Fed. When risk appetite picks up, however, the Dollar will probably be dumped very quickly in favor of higher-yielding alternatives. These days, I feel like you could take that title and substitute pretty much any currency for the Australian Dollar. Let’s face it- the EU sovereign debt crisis has hit a number of currencies extremely hard, as investors have fled anything and everything risky, in favor of the US Dollar, Swiss Franc, Japanese Yen, and Gold. Still, the Australian Dollar merits special attention, because in the forex markets, it has come to be a symbol of risk-taking. For veritable years, every credit expansion and economic boom has been accompanied by a surge in the value of the Aussie, and 2009 was no exception. As the global economy recovered and risk aversion ebbed, the Australian Dollar rose by more than 40% against the USD. It has been helped in its upward course by Chinese demand for its natural resources and strong interest rates, especially compared to the rest of the industrialized world. That the Australian Dollar has already fallen 14% (from peak to trough) against the US Dollar over the last month is less due to economic and monetary factors, however, and more the result of an ebb in risk-taking. “The Australian dollar is considered a barometer of global risk appetite. Its fall reflects the quick change in mood, as Europe’s debt problems and China’s monetary tightening plans cloud expectations for the global economic growth,” summarized one analyst. From another standpoint, the yield advantage associated with holding Australian Dollars is no longer enough to compensate investors for the added risk. After adjusting for inflation, real interest rates in Australia are only about 2.5% (the nominal benchmark rate is 4.5%). This is still 2.5% higher than the benchmark US Federal Funds Rate, but not very attractive if you consider that the Australian Dollar has fallen by more than 2.5% against the US Dollar in several individual trading sessions in May. Moreover, the Reserve Bank of Australia (RBA) is signalling a pause in its rate hikes. If futures contracts are any indication, the Fed and the ECB will raise their respective interest rates before the RBA moves again. Going forward, the consensus is that a sustainable level for the Australian Dollar based on current fundamentals is probably around .75 AUD/USD. However, the Aussie rallied 5% against the US Dollar last week, which suggests that investors still aren’t ready to give up completely: ” ‘The environment is not yet ripe to get truly bearish on the Australian dollar,’ said Commonwealth Bank Strategist Richard Grace. There are positives on the horizon, namely a better outlook for the U.S. and a calming of the Greek crisis, he said. He’s forecasting a return to $0.87.” Personally, I could see the Aussie going either way. Parity probably isn’t on the table anymore, but virtually everything else still is. The South Korean Won has been one of the biggest losers from the EU sovereign debt crisis. 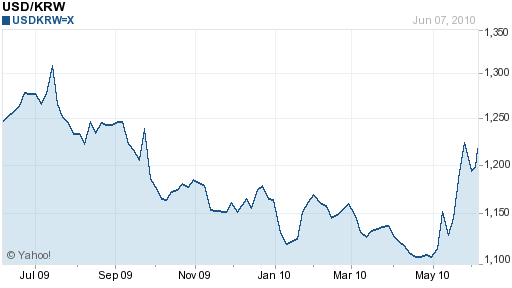 After a stellar 2009, the Won is off to a shaky start in 2010, and has lost 12% of its value in the last month alone. According to analysts, The won is “most sensitive to risk aversion” of any currency in Asia – or even the world. Thus, when the President of Hungary likened his country’s fiscal situation to that of Greece and inadvertently ignited fears that the crisis was spreading, the Korean Won immediately fell by 5% – the largest decline in 17 months. To elaborate, South Korea’s short-term foreign currency debt is extremely high (60% of foreign exchange reserves). That’s primarily due to Korean exporters’ hedging activities, which for risk management purposes, need to be offset by short-term borrowing by banks in the money market. Since this debt needs to be rolled over frequently, South Korea is especially vulnerable to liquidity crunches. In fact, the Won has been called a “VIX currency,” since it tends to fall when volatility (proxied by the VIX index) rises. Hence, the Won lost 50% of its value during the peak of the credit crisis, and has already declined 10% this time around. How should one proceed? If indeed you believe that the Won is being harmed by the prospect of conflict with North Korea, you might be inclined to agree with the notion that, “The recent sell-off in the won has been overdone and should correct, assuming that the North-South tensions will ease in the months ahead.” In fact, if war is avoided, the current bear market could be an excellent buying opportunity, and the Won could still be on track to rise to 1,100 USD/KRW by year-end, conforming to analysts’ median expectations. On the other hand, if you believe that the Won’s woes are largely attributable to the EU fiscal crisis, there is very little reason to hold the Won, since that crisis will probably only get worse before it gets better: “The Korean market was precariously positioned, with high multiples, above-trend earnings, heavy positioning towards risk and ominous technicals suggesting little sponsorship for strength.” In this case, the Won could easily fall to 1,300 – or worse – before the year is out. In any event, South Korea will host a meeting of the G20 this week, which should yield more clarity into what the rest of 2010 has in store for the Won. The Euro has now declined for six consecutive months against the Dollar. It is down 25% from its 2008 high and 15% in the year-to-date. It declined 8% in the month of May alone. En route to a four year low, the Euro also fell below the 50% retracement level ($1.21) of its rally from 2000-2008. It’s now too clear where the Euro is headed: parity. That’s right. Parity. We’re not talking about the Canadian Dollar or even the Australian Dollar. We’re talking about the Euro, which only yesterday was trading at a lofty $1.60 against the Dollar. According to CLSA Asia Pacific Markets, “The euro will sooner or later go to parity with the U.S. dollar.” Meanwhile, “The research firm Capital Economics predicts that the euro will reach par with the U.S. dollar by the end of next year.” There wasn’t even a perfunctory attempt by either firm to justify the prediction. Given the way that the Euro has been trading, it probably wasn’t necessary. Since the last time I reported on the Euro, the bad news has continued to pour in. 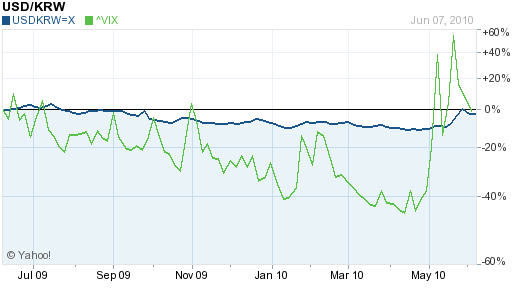 Spain officially lost its AAA credit rating, and concerns are mounting that the crisis is spreading to Hungary (not even on the radar screen last week) and Italy: “While Italy may not be as structurally vulnerable as Greece or Portugal, the relative underperformance of Italian credit default swaps this month suggests that investor concerns may be rotating away from Greece.” As if it wasn’t bad enough that investors had lost confidence, now banks won’t even lend to each other. The main issue, which critics of the bailout have been quick to point out all along, is that the fiscal problems that precipitated the crisis are still extant. Spain, for example, currently has the third largest budget deficit in the EU, and yet, it is struggling to make meaningful cuts and pass the necessary “austerity measures.” Germany has tried to unilaterally amend the EU treaty in order to force member states to balance their budgets, but to no avail. If a full-blown crisis is to be avoided, significant structural reforms will have to implemented, and soon. For many, that the crisis will not be resolved is a foregone conclusion, and they have instead embraced the possibility of ECB intervention to stem the Euro’s decline. The last time the ECB intervened was in 2000, shortly after the Euro was introduced and when it was trading around 87 cents to the Dollar. Experts are divided over whether intervention is likely or even possible. Some have thrown out $1.10 or $1.00 has hypothetical levels at which the intervention would be likely, but the fact of the matter is, no one knows. Any intervention would necessarily involve the Fed and the other important Central Banks of the world. Don’t forget that when the Euro collapsed at the onset of the credit crisis, the Fed quickly underwrote a series of swaps to the ECB, and it could prove to be a willing participant this time around. The ECB is naturally being coy, with President Jeane-Claud Trichet declaring: “Let us be clear, it is not the euro that is in danger.” Its monetary policy is still extremely accommodative, via low interest rates and a form of quantitative easing. This makes it favorable for investors to bet against the Euro, and is starting to earn the ECB the ire of EU politicians and economic policymakers. Given that the Euro’s decline has become self-fulfilling, pressure on the ECB will continue to mount, until the Euro reaches parity, and/or it has no choice but to intervene to prevent the common currency (and its raison d’etre!) from collapsing entirely. Japanese Yen: 90 or 95? After a healthy appreciation against the Dollar in 2009, the Yen has backed off slightly in 2010, hovering around the level of 90 USD/JPY. Still, every time the Yen falls, traders quickly push it back up to 90. One has to wonder: Will the Yen ever fall? Analysts attribute the Yen’s resilience to a series of aberrant developments, rather than to some kind of cohesive trend. Above all, there is the sovereign debt crisis in Europe, which has directed a steady stream of risk-averse capital to Japan. Under the existing paradigm, the US, Japan, Switzerland, a handful of other economies are still thought of as financial safe havens, a notion which serves to explain the Yen’s surge to a 10-year high against the Euro. Outside of this, there is also some debate as to what constitutes a safe-haven currency, and whether the Yen qualifies. On the one hand, Japanese interest rates are extremely low and monetary policy remains accommodative. It’s capital markets are deep (though not exactly buoyant), and for investors that value capital preservation, Japan would seem like a reasonable choice. On the other hand, this mentality is facing a backlash as a result of prolonged political uncertainty. Since unseating the Liberal Democratic Party in 2009 – an historic achievement – the Democratic Party has been in a dither and implemented no new, meaningful policies. The finance minister was replaced a few months ago, and to top it off, the Prime Minister himself is set to resign. It is both the uncertainty – the perennial enemy of the carry trade – and the potential replacement which worries investors and currency traders. The current front-runner, Finance Minister Naoto Kan, has not made a secret of his desire for a weak Yen: “Markets in principle should determine foreign exchange rates, but I think we must closely watch [markets] and ensure that there won’t be any excessive yen rises.” As Prime Minister, he would probably be more aggressive than his predecessor in intervening in currency markets, if need be. Perhaps with Mr. Kan’s support, the Central Bank of Japan recently announced that it would inject $20 Billion into capital markets as part of of an effort to “calm” the financial markets. The Central Bank is apparently committed to “combating deflation,” which in some circles is code for currency devaluation. In short, the only real question – posed in the title of this post – is the exchange rate that the Japanese leadership is targeting. Currency valuation is always more art than science, so it’s unclear not only the rate that in reality is fair, but also the rate that Japan perceives as fair. My feeling is that it’s north of 95 Yen/Dollar. It seems that anything between 90 and 95 is acceptable, while a drop below 90 is cause for intervention. For now, that intervention has been entirely vocal; if the government’s approval ratings remain in the basement, however, it could turn into actual intervention.